Our 2018 Raffle has ended! The winner was Kevin Owens. (story from Moultrie News) Stay tuned for information about 2019 fundraisers! Tickets are $20 each; three (3) for $50; seven (7) for $100. For sale of multiple tickets (3 for $50 and 7 for $100) to individuals, the individual’s name, as purchaser and all contact information must appear the same on all tickets. Only 5,000 tickets will be sold. 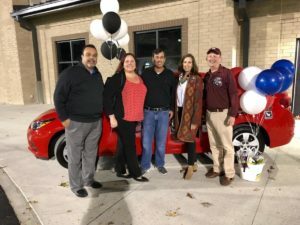 Grand Prize is a 2018 Chevy Cruze from Starling Chevrolet, or you can opt for $10,000 instead of the car. The Winner is responsible for all taxes and fees (including state and federal income taxes). In Person – In Person from Band boosters, students and parents, and at various events throughout the community including Wando Band events to be announced. Payment can be made in cash or check made payable to “Wando Band Boosters.” All Raffle Ticket sales after Sunday, October 28, 2018, must be made with Cash payment. Online – Online Raffle Ticket Sales via Debit Card. Online Raffle Ticket sales will be available through October 30, 2018. If you have questions, please email Ways-Means@WandoBands.org. The 2017 Car Raffle Winner. Thanks to Mount Pleasant Chevrolet and GM John Thomas for partnering with the Wando High School Band Boosters on our 1st Annual Car Raffle. And thanks to everyone for making our first raffle a huge success! Congratulations to Jim Barrett of Rock Hill for winning the 2017 Chevy Cruze! 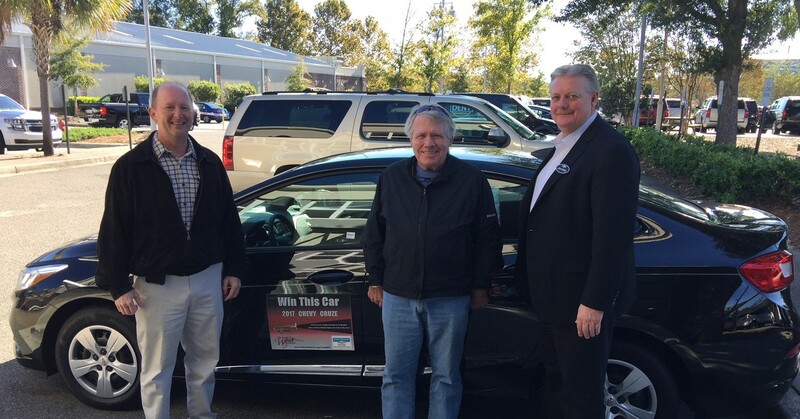 Wando Band Booster President Jay Johnston, Car Raffle Winner Jim Barrett, and John Thompson from Mt Pleasant Chevy stand beside the 2017 Chevy Cruze! CONGRATULATIONS Jim! 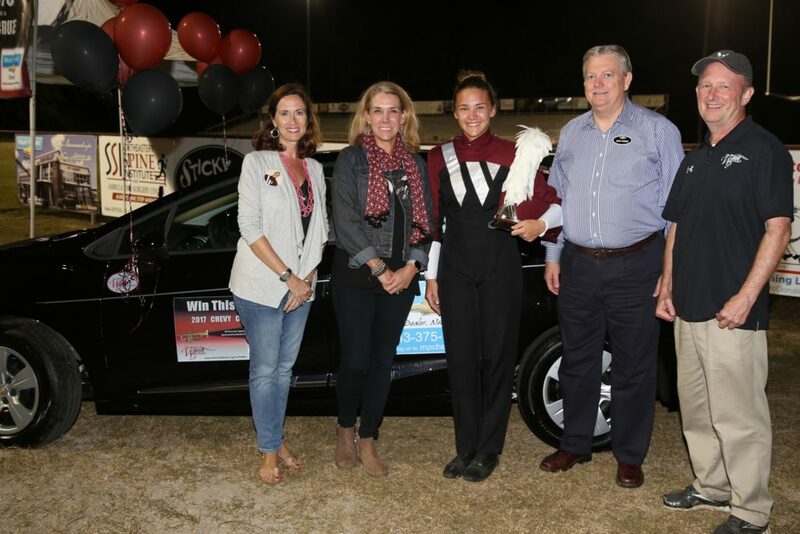 Smiles abound as Mount Pleasant Chevrolet GM John Thomas poses with Wando Band student Kate Dantzscher and the 2017 Chevy Cruze that Kate’s grandfather Jim Barrett of Rock Hill, SC won following the drawing of the winning raffle ticket as part of Wando Marching Band’s Community Performance October 21. The Bands of Wando thanks John Thomas and Mt. Pleasant Chevrolet for their partnership in our first annual car raffle. L-R Wando Band Booster VP of Ways and Means, Mollie Leigh; Wando Band parent Beth Dantzscher, Kate Dantzscher, Mt. Pleasant Chevy GM John Thomas, Wando Band Booster President Jay Johnston.